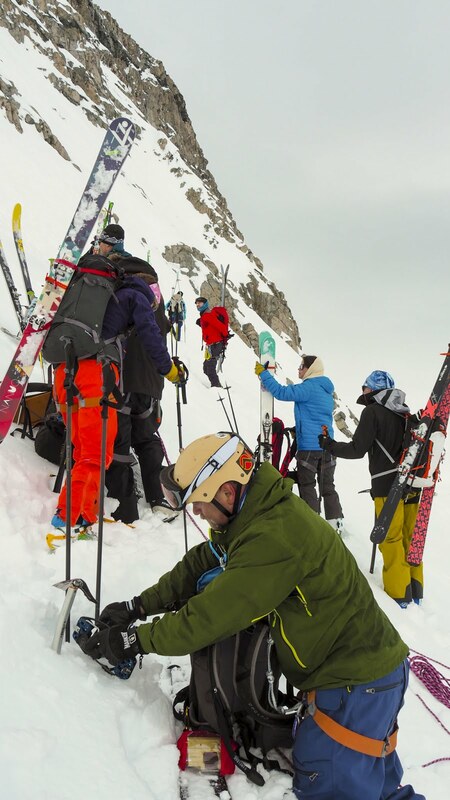 This blog post is in English for all our new freeski friends around the globe! 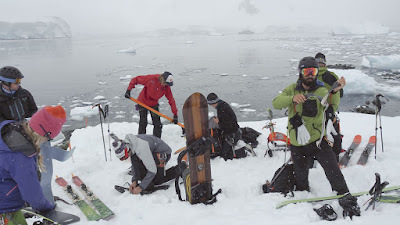 Ice Axe Expeditions trip to Antarctica is something extraordinary and unique to say the least. We got hooked on this trip a year ago and the excitement has been building up till the day of our departure from dark and wet Finland on November 4th 2015. 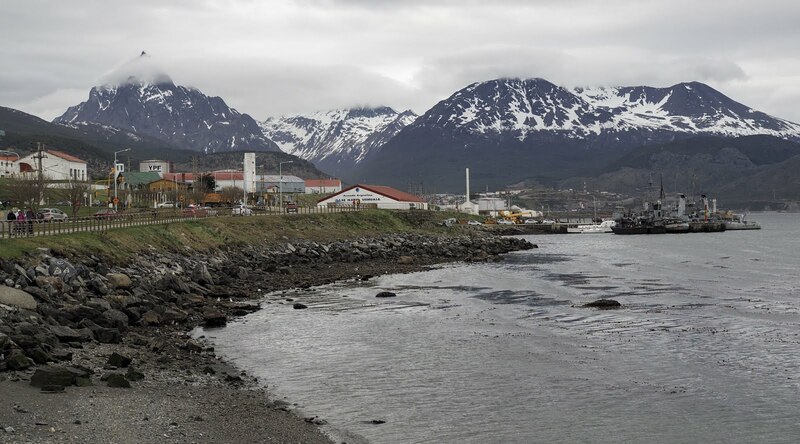 After 27 hours of travel we finally arrived to Ushuaia through Frankfurt and Buenos Aires in the afternoon of November 5th. To our great satisfaction and surprise, also all of our gear arrived on the same flight. 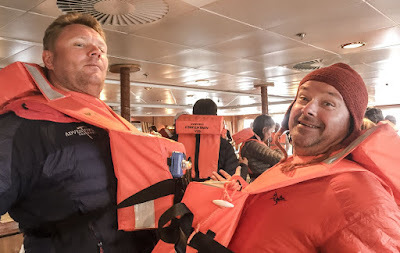 We had taken couple of extra days prior to the embarkation to the Antarctic just in case, but this time everything went just fine. 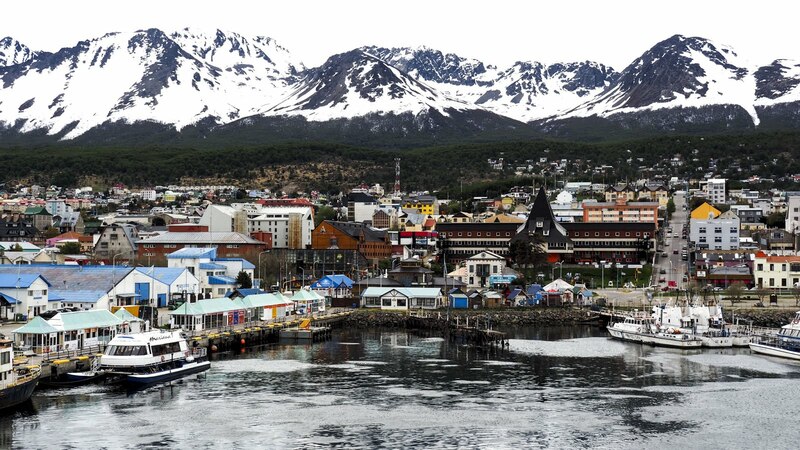 In Ushuaia we had the opportunity to acclimatise ourselves and do some skiing in the nearby mountains. The expedition started more or less with a get together on the eve of the 6th and on the 7th our mountain guides took the groups to the mountain, just to make sure that everyone has all needed gear and they know how to use them. So we did have time for some great Argentinian food, wine and last minute gearing up. On the morning of November 8th we packed and checked out the Hotel Albatros and finally at 3pm we boarded the ship Sea Adventurer. Adventure begins! The ship, Sea Adventurer (formerly known as Clipper Adventurer and Alla Tarasova), was built in 1975 in Yugoslavia and being class 1A ice enforced ship, it was stationed in Murmansk until the collapse of the Soviet Union. It has been recently renovated and is sailing under the flag of Bahamas. 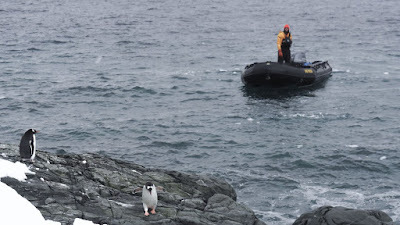 The ship is owned by a Canadian company called Quark Expeditions. 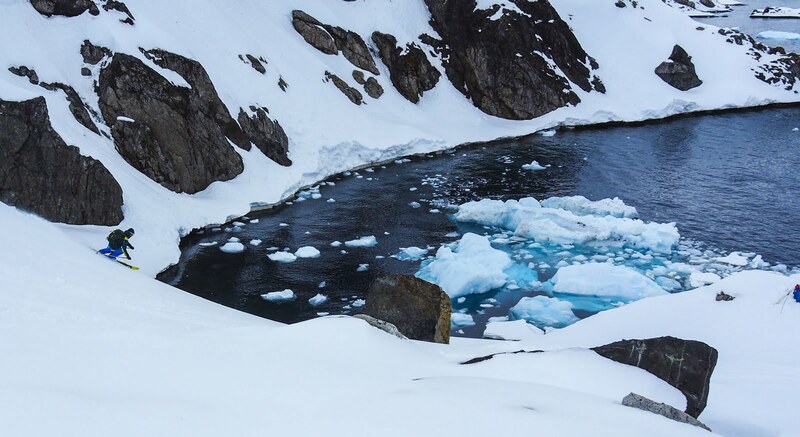 Quark is the leading tour operator of Arctic and Antarctic cruises and their experience really shows. The ship can board 117 passengers and 87 members of the crew. 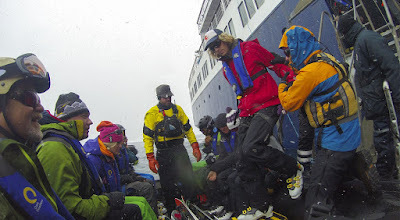 The crew consists of the hotel personnel, sailors and the expedition team. The expedition team itself is really amazing bunch of expertise and experience. We have marine biologists, ornithologists, geologist, historian, medical staff etc. on board to keep us occupied and educated throughout the trip with cool lectures and answering our questions about whales, penguins, seals, ice, water and what not. They are also our Zodiac drivers taking us ashore at the destination. And then there is the Ice Axe team. Doug Stoup is the owner of IceAxe Expeditions which is specialized in taking people to very remote places to ski around the world. This trip to Antarctica is the 8th of it’s kind, but Doug has been on the continent like 17 times before. The company has 18 mountain guides from Australia, New Zealand, Canada, Iceland, all over US and one from Finland (Ode Siivonen). The experience among this bunch of guides is just amazing. They have done some pretty awesome stuff along and before their guiding careers. We are in good hands! All of the passengers on this cruise are on Ice Axe trip - the whole boat has been chartered to us. So most of us are here to ski, but some have brought along family members who will spend their days hiking, snow shoeing and making Zodiac cruises while the most of us are on the mountains. 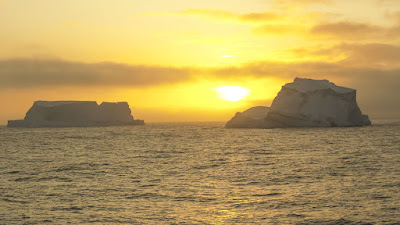 The trip over the Drake passage takes us two and half days. The conditions were fairly good and not too rough weather. As we are closing in to Antarctica we get to see ice bergs, seals and even a pod of humpback whales. All a long the crossing, the different albatrosses and petrels are flying around the ship keeping us company. Life on board is pretty busy with either eating or a presentation happening about every other hour. The presentations that the Quark experts are giving us are really interesting about the Antarctica, its history and nature. Before our arrival at the destination we are also introduced to the extreme environmental aspects. Our backpacks are vacuumed and our ski boots are disinfected to make sure that we do not import anything to the continent that does not belong there. 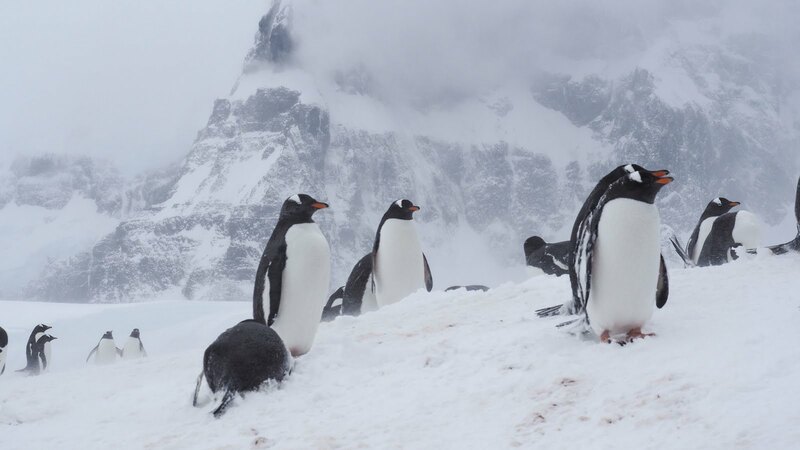 Protecting the continent is top priority and the tourism is under strict rules and is closely monitored under the Antarctic treaty. Finally we are there! 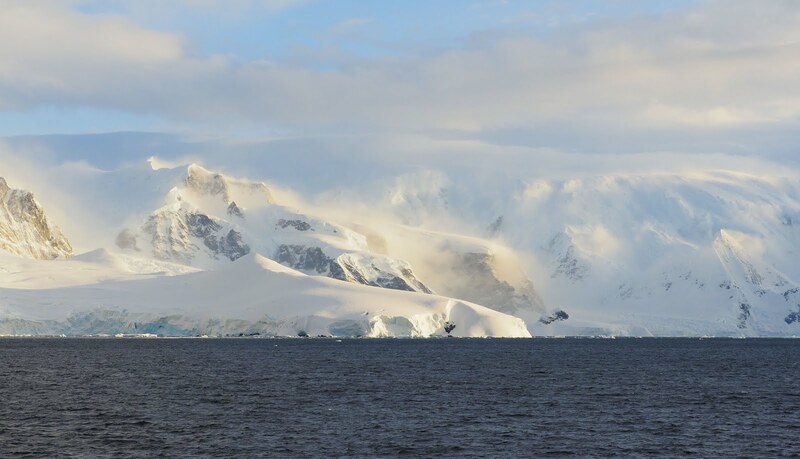 During the second night of the voyage we reach the Southern Shetland islands on the North-West side of the Antarctic Peninsula. 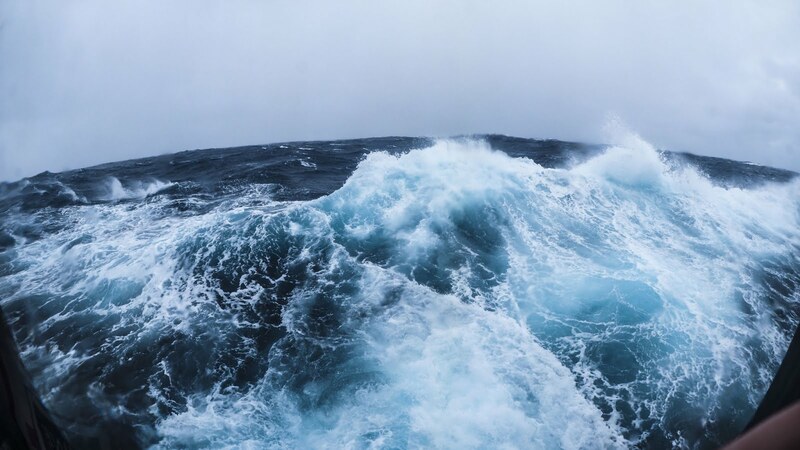 Unfortunately also some rough weather has reached us and we need to stay in a holding pattern in the Gerlach Strait until lunch, before we can finally board the Zodiacs and get to go ashore. Our group is going to the landing site Bravo for the first taste of Antarctica snow. Looks like we are taking it off easily as the terrain is quite moderate for what we will have ahead of us. Nice skin up and ski down before we call in the Zodiac to take us the landing site Alfa. The slope is bit steeper and we have to turn back before the summit as the weather is closing in and we are afraid of loosing visibility. So we ski down in flat light, but Ode keeps us away from the crevasses. We’ve done it, skied in Antarctica! Sunny morning. This is the best day weather wise and we certainly make the most out of it. All groups are out really early in the morning and we get to ski some really scenic slopes. 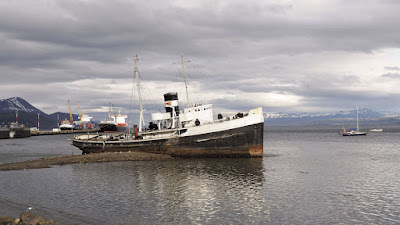 We also visit a shipwreck from the whaling days before we have to move on. 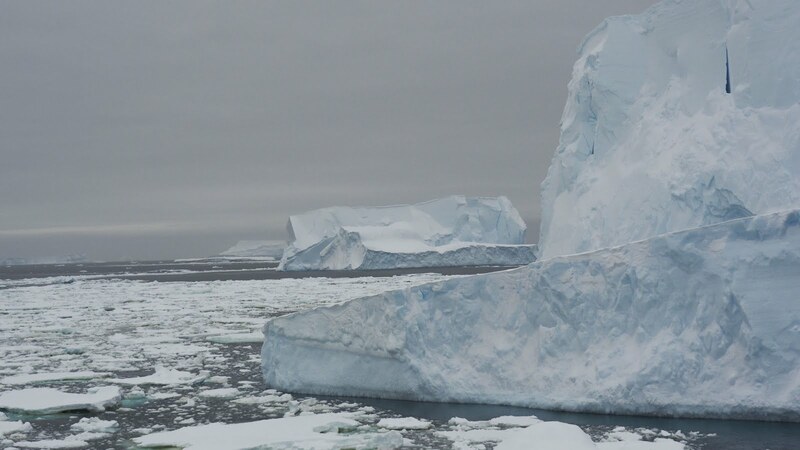 We are making quite long distances between the skiing objectives and anchor for the nights. The expedition team gets up at sunrise, which is at 4am and the guides are sent ashore to scout the landing sites around 6, if the weather permits. Our wakeup call on the ship is usually at 7am and we head out just after breakfast between 8 and 9. Our skiing sessions last approximately 4 hours, so it is not like we are out on the slopes all day. Good thing is that we have many skiing days. Blizzard! We remain in the holding pattern for the whole day due to really bad weather. Winds exceeding 40knots in gusts and close to no visibility with heavy snow. But it’s not like we remain on board all day. We get ashore to visit an old research station at Port Lockroy. The station is no longer occupied, but serves as a museum. Few weeks after our visit there will be some museum staff arriving to manage the museum for the duration of season. We get to visit the main building as the mountain guides dug the living quarters out of snow. Actually the station is occupied. 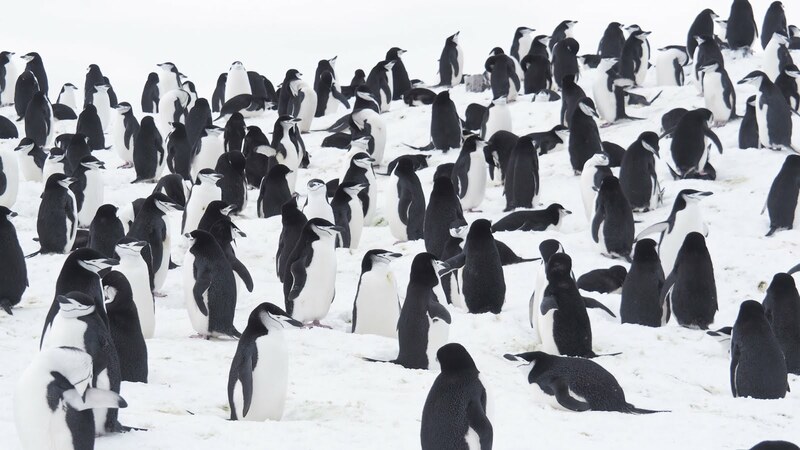 There is a penguin colony right there around the buildings. Gentoo’s are all over the place and it is really cool to just sit down in the snow and watch them go by and do their stuff. Great experience. 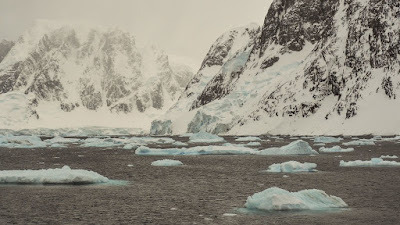 After the visit to Port Lockroy we move further south. On our way we sail through Lemaire channel, which is really picturesque place. It is a narrow channel with steep stonewalls rising right from the sea several hundred meters tall. We are the first vessel through the channel this season and we can see that there is clearly more ice and lots of ice bergs going further south. We are getting closer to Ukrainian Vernadsky station which is manned all year around but ice is stopping us. We spend the night anchored by Peterman Island. Weather has cleared and we make ashore. 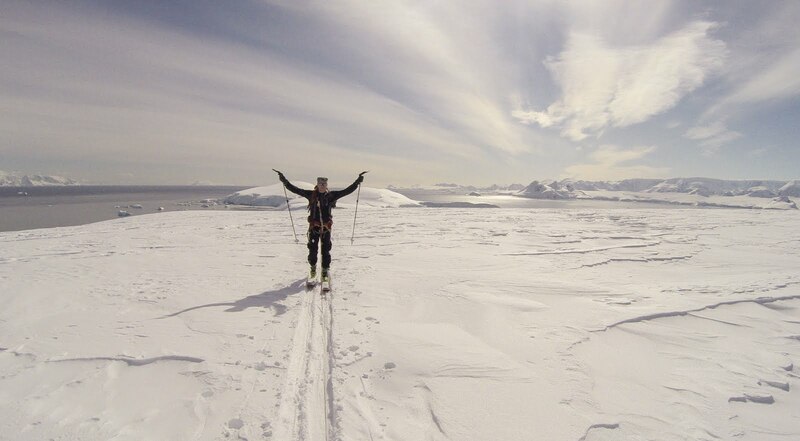 This time we actually ski on the Antarctic peninsula, so we are doing it on the continent itself. Other objectives are all on islands just off the peninsula. 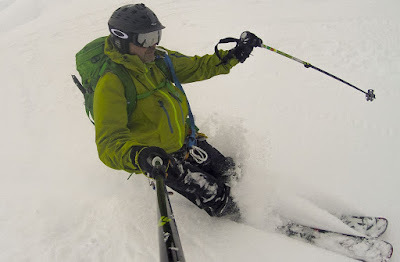 We ski up to Mount Mill and make summit at 740m. 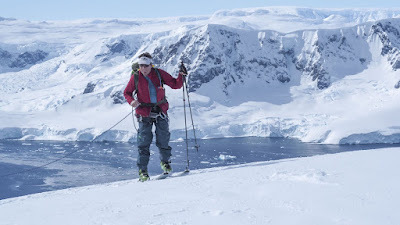 The last stretch to the summit is really steep and we get to do some true ski mountaineering bootbacking up with crampons on and hanging on to the ice axe. Sweet! The run down is great carving cruising as the snow is smooth and very hard packed on the ice. Yep - all the skiing is on glaciers, so we skin up and stay roped as long as we switch on to the skiing mode to make down the hill. We see serious crevasses, but the skiing objectives has been selected based on information from earlier trips and there is not that much dodging we have to do. Amazingly no one drops in to a hole - thanks for the guides for that! After we return to the ship we hoist anchor and start making our way North again. We reach 65* 15" degrees, and this is the furthest in south we get. 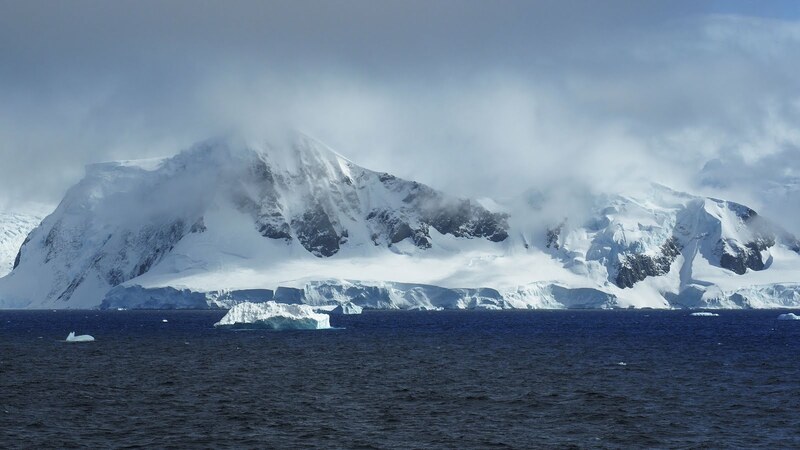 The crossing of the Antarctic circle is not possible on this cruise, but maybe next time! After sailing through the Lemaire Channel we get to see a spectacular show. A family of 5 Orcas, a.k.a. Killer Whales swim past the ship and we get to witness how these great creatures make their way towards the penguin colonies of the Peninsula to feed. In the evening we get to visit a Adelié penguin colony on Danco Island in a beautiful sunset. Snowstorm. Holding pattern again in the morning. Air is full of snow and visibility near zero. But it only lasts through the morning and we get ashore finally. And what is it that we find? Pure Antarctic powder snow about foot deep. This is something that we did not anticipate at all and we skin up the long hill giggling and excited about the first run down. Well, actually the first descent is not that good, but later we get some really good runs in the deep and soft snow. So much fun! Later in the afternoon we get back to the boat in order to catch some more excitement in form of the polar plunge. Yes, we get to dip into the Antarctic sea and yes, you bet it is cold water! After the rush of powder skiing and polar plunge the day will end with the much awaited "White party of the white continent". Everyone has brought white costumes for the party and it's "party on, dude"! Last day on the continent. 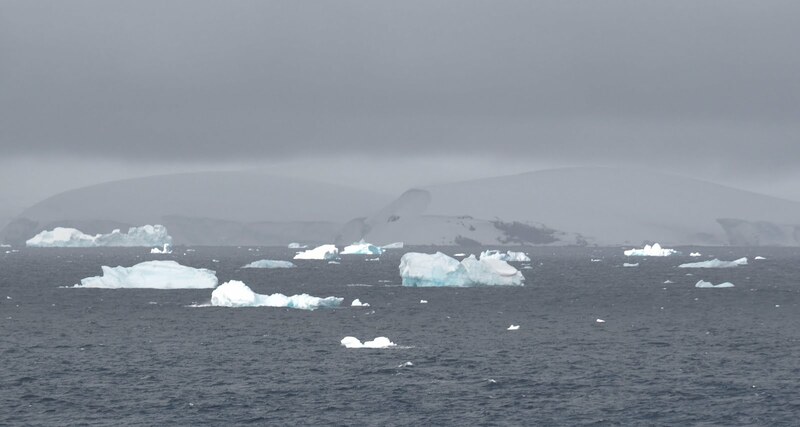 Ship has moved overnight to the South Shetland Islands as we will start our voyage back across the Drake in the evening. But before that we still get one day of skiing. We climb the steep and crevassed mountain sides with great snow conditions. Also here it has been snowing recently, so we get to do some good skiing in the fresh snow again. One time we need to return back from a bootback hike due to increased possibility of avalanche. This is actually the only time an avalanche is a concern. Few good runs and we are ready to head back to the boat. We sail off in the evening and get to say goodbye to the continent enjoying a beautiful sunset with some magnificent icebergs. Sail across the Drake passage is somewhat similar to our journey coming south. Eating, drinking, going through photos and videos and enjoying the presentations. Eventually the weather conditions deteriorate significantly and we get in the middle of hurricane class storm with wind speeds up to 65 knots. On our second night we wake up at 1.30am having lots of flying objects in our cabin. We have to secure all belongings and try to hold on to the bunk. Next day we really get the best out of Drake with huge swells banging on the ship with extreme winds. Captain needs to adjust the course just to make the sailing bearable. Unfortunately this means that we will not have the opportunity to see Cape Horn. 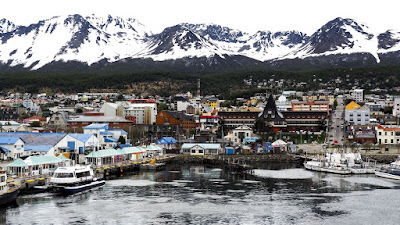 Last night on the ship is sailing through the Beagle Channel back to port Ushuaia. Once we are finally back on solid ground we see the sister ship, Ocean endeavor, also a Quark ship. She has a huge hole on the port side. It turns out that she had hit an iceberg by the Peninsula earlier that week at 3.30am. It must have been scary as hell to hear the general alarm and put on the life vest and go on deck in the middle of the night. Luckily she made her way over the Drake safely, but it was a rude ending to that cruise. It could have been us! Time to say goodbye to many new friends. Some fly out right of way and during the next day. We are staying in Ushuaia for three days enjoying the town and sights near by, like hiking in the Tierra del Fuego national park. Finally the day of departure arrives and we start our journey back to home where we arrive in the evening of November 23rd. There are not enough words to explain this trip and everything we got to experience. It has been really a journey of a lifetime! Thank you to all who were there and made this happen! Adventure Partners on kasaamassa ryhmää seuraavalle etelmantereen reisulle syksyllä 2016. Jos hiihto tai lumikenkäily maailman viileimmissä ja villeimmissä maisemissa kiinnostaa niin ole yhteydessä make [at] adventurepartners.fi.